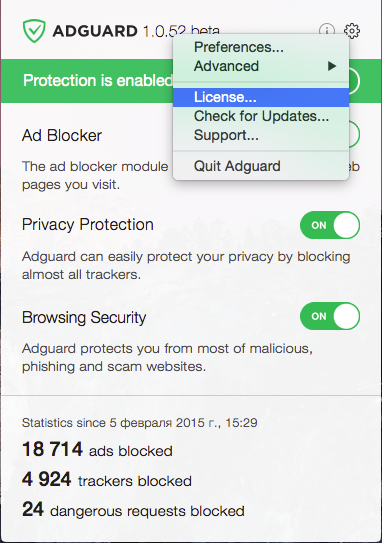 How to activate AdGuard with a license key? 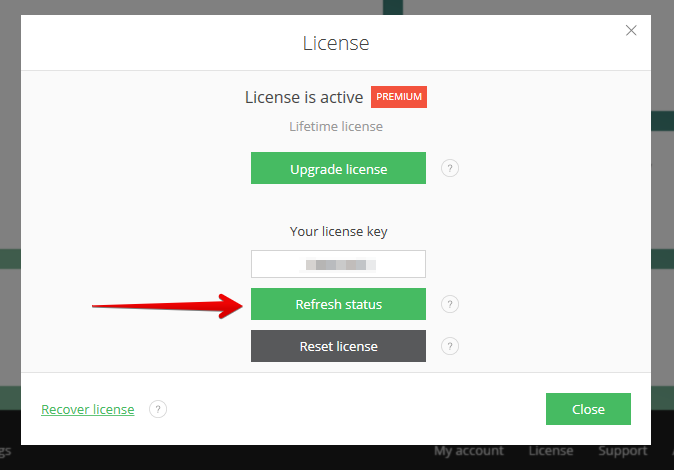 How to recover my license key? How to register the AdGuard Account? What functions are available in AdGuard Account? What to do after the key was renewed? Standard - allows you to activate AdGuard on Windows PC or Mac. 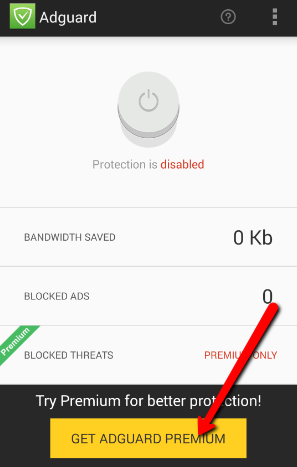 Mobile - allows you to activate AdGuard on your Mobile device. Premium - mobile and standard in a single license. 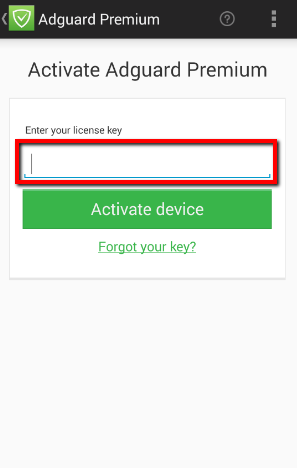 Allows you to activate both mobile device and computer with the same license key. Bonus License - is given for winning any contests or prize draws. Equivalent to standard license. Beta-test - special type of license for AdGuard beta-testers. Program activated with this type of license is automatically updated to the latest available beta. 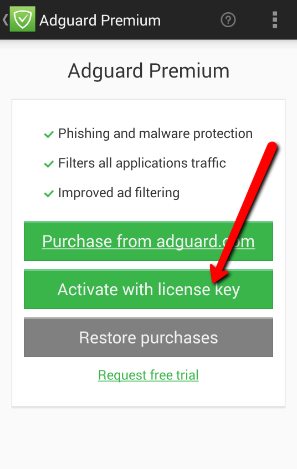 You can manage your license keys in your AdGuard Account. To purchase AdGuard license key click here. In the opened window enter your license key and press 'Activate license key'. Once the program is activated with a license key, the license key is “bound” to the device on which activation was held. License key may be activated on a limited number of devices. If the license key is already used on the maximum possible number of devices, you need to reset it before using this key again. You can do it in your AdGuard Account. You can easily find out which license keys belong to you in your AdGuard Account. The binding of your license key with your account is held with your email address, which was used for purchasing of AdGuard. Please note that it is often not enough to just find out what your license key is. If it was already used on another computer, it’s necessary to unbind it from that computer through the AdGuard Account before using it again. If you purchased the AdGuard License key – your Account is already registered with your email which was used by the purchase. You were to receive an email on the automatic registration of your Personal account and the link for its activation. If you haven’t received this email or forgot your password you can recover your password. If you don’t have AdGuard Account, we suggest you register it by clicking this link. AdGuard Account gives you an opportunity to manage your license keys and their binding with your computers. Find more on functions of the Account below. When you enter the AdGuard personal account you will see the list of your license keys and their current status. If the license key is activated on one or more computers you will see the list of these computers under the license key. License key can be activated on a limited number of computers, before using it again you will have to unbind it from one of the computers. 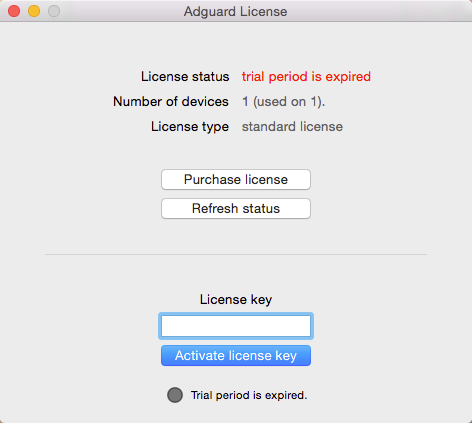 Once you have renewed AdGuard for another year - you will need to restart the program/app or go to the 'License' section and refresh the license status for changes to take effect. 1. Go to the payment page. 2. Depending on whether you want to prolong an existing license Вkey or to purchase a new one, choose the appropriate option. 3. Choose the license type. Currently, we have three different license types - Premium, Standard and Mobile. Note that Mobile license only suits for the Android devices. AdGuard for iOS is not activated with license key - you can download it from iTunes AppStore. 4. Choose the preferred currency, license period and the number of devices you want to use AdGuard on. 5. Enter and confirm your email address. Attention! Please, pay close attention to the email address you enter. The license key will be sent to this address, and it will be used to automatically create your AdGuard personal account. Make sure you don't make any typos. 6. Choose the payment method. We offer the possibility to pay with a credit card or PayPal. The purchased license key will be sent to the indicated email address. You need to activate your AdGuard with this license key. The detailed instruction on how to do it is available here. To get a refund, contact our support team and indicate what payment option did you use. Note that refunds may be rejected if you've purchased the license key more than 60 days ago.